Preheat oven to 425 degrees and pull out a 8x12 glass baking dish. Heat a cast iron skillet sprayed with canola oil spray (we usually use Pam or Costco brand). While heating, put all the sauce ingredients in a blender -- the onions, garlic, spices (Italian seasoning, pepper, crushed red pepper, salt), diced tomatoes, tomato paste, tomato sauce, fresh cut tomato and water -- and blend until combined (it will be chunky!). Pan sear the slices of zucchini until lightly browned on each side. 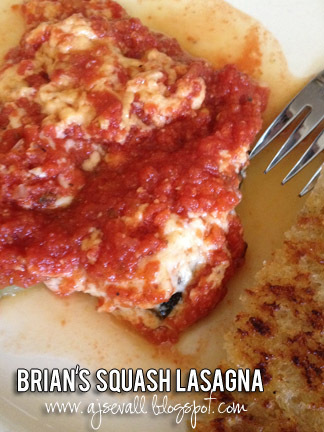 Time to build your lasagna layers -- put about half the sauce in the bottom of the baking dish. Layer about half of the pan seared zucchini slices next, then about half of the grated mozzarella cheese. Your next layer will be the rest of the zucchini slices, then the rest of the cheese and top with the rest of the sauce. Cover with aluminum foil (to protect your oven from splatters!) and bake at 425 degrees for 50 minutes. Serve with your favorite salad and bread. Enjoy!! I'll be making this soon. Thanks for sharing!